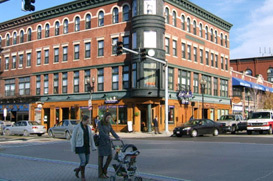 Brighton Center is a vibrant community centered on the intersection of Market & Washington Streets. It is the commercial heart of Brighton, home to dozens of restaurants, shops, cafes and other businesses. Vanguard Realty has an office in Brighton Center at 317 Washington Street. Real estate in Brighton Center consists primarily of one and two-family homes, some of which have been converted to condos. Condos tend to be in buildings with small associations, although there are some recent new developments with larger numbers of units. The most common property in Brighton Center is a two family home where an owner lives in one unit and rents out the other, although there are also many single families and small condo buildings.